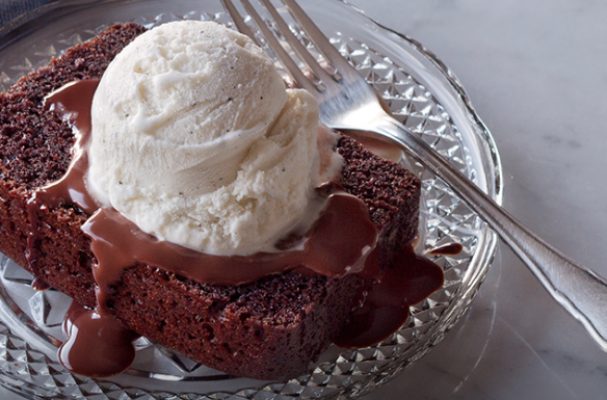 Steamed chocolate pudding cake is a modern take on a classic English dessert. This dynamite cake is as moist as it is rich. The ice cream is a must-have garnish as it cuts the richness of the cake. I like to serve with more chocolate sauce or salted caramel sauce. Step 1: Preheat oven to 350° Spray inside of a 9x5-inch loaf pan with cooking spray and line with parchment paper, leaving an overhang on two opposite sides. Spray parchment. Step 2: In a small saucepan, bring 2/3 cup water to a simmer. Add cocoa powder and whisk for about 30 seconds, or until mixture has thickened slightly. Set aside to cool. Step 3: Meanwhile, in a small bowl, whisk flour, baking soda, and salt. In a large bowl, whisk sugar, oil, eggs, and vanilla to blend. Add flour mixture in 3 additions, alternating with buttermilk between each addition. Whisk in cocoa powder mixture. Step 4: Pour batter into prepared loaf pan and wrap pan tightly with plastic wrap. Step 5: Place pan in a 13x9-inch baking dish. Add enough boiling water to dish to come halfway up sides of pan. Tent baking dish tightly with aluminum foil. Carefully transfer dish to oven and bake for about 1 hour and 20 minutes, or until cake springs back when gently pressed and a toothpick inserted into center comes out clean. Remove plastic wrap and transfer loaf pan to a wire rack to cool for 5 minutes. Step 6: Meanwhile, in a small saucepan, bring cream just to a simmer. Remove from heat and add chocolate. Let sit for 3 minutes. Whisk glaze until smooth. Step 7: Invert cake onto a serving platter. Remove parchment. Pour about one-fourth of glaze over warm cake. Slice and serve with Breyers® Natural Vanilla Ice Cream and remaining glaze.